Francisco Paesa — ex-secret agent for the Spanish government and the man responsible for the most important operation against the Basque terrorist group ETA — is framed by his own government and forced to leave the country. When he is finally able to return to Spain, he is broke and his personal life is falling apart. 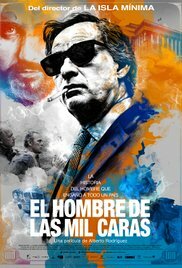 It is then he receives a visit from Luis Roldán, the powerful former Commissioner of Police who offers him one million dollars to help him safeguard twelve million dollars that were embezzled from the budget he used to control. Paesa’s acute mind will plan revenge in order to seize Roldán’s money, fooling an entire country in a brilliant and intricate operation worthy of the best illusionist. Read more on Wikipedia.